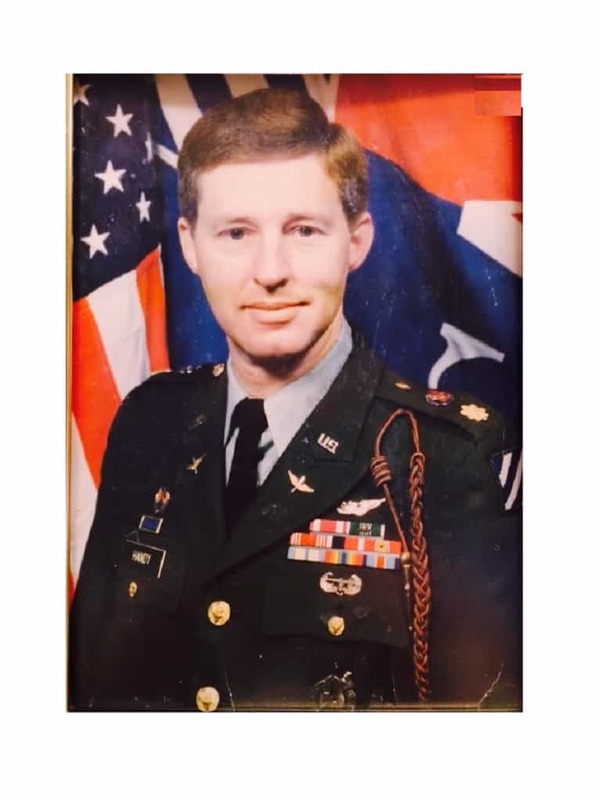 Major Keith M. Handy enlisted in the United States Army in 1973, during the Viet Nam war, as a Russian Linguist and worked in intelligence out of Berlin, Germany during the “Cold War” with the Soviet Union. After 3 years in Intelligence and four years as a Counter Intelligence Agent, Keith was commissioned as a Counter-Intelligence Officer, working for the Chief of Staff of Intelligence for the United States Army, in a specialized unit formed by President Reagan. In 1982 Keith went to flight school and became an Aviation Officer. His first command was with C Troop, 2nd Squadron, 10th Cavalry where he had a world-wide deployment mission with the Army’s first Light Infantry Division. In 1985 and 1986 he was trained and certified as a Contact Instructor Pilot, Combat Tactics Instructor Pilot, Night Vision Systems Instructor Pilot and Instrument Flight Examiner, making him the only Commissioned Officer at the time to hold all 4 designations. He was then assigned as an evaluator with the US Army Directorate of Evaluation and Standardization. In 1988, Keith took command of the Aviation School of the Americas, where he and his staff of U.S. and foreign Officers supported all U.S. Army aviation operations throughout Latin America to include the war in El Salvador and drug interdiction in Columbia, Bolivia and Peru. In 1989, Keith was sent to Argentina as part of a U.S. State Department team to repair relations with the government of Argentina, which had been damaged during the Falkland’s war with Great Britain. While in Argentina he taught air to air combat to the Argentine Army and acted as chief translator for all high level negotiations. In late 1989 Keith turned down a US State Department assignment to Latin America and an Embassy assignment to Pakistan, and accepted a recruiting assignment in an effort to provide better schooling and growth opportunities for his young family. For 18 months Keith commanded a recruiting company in the Midwest, covering 4 states and headquartered out of Sioux City Iowa. In 1991, Keith was reassigned to Germany and the 3rd Infantry Division and from there to Incirlik, Turkey and Northern Iraq where he served as Director of the Joint Operations Center, helping to maintain the Cease Fire with Iraq and providing humanitarian assistance to the Kurdish people of Iraq, who had been brutalized by Saddam Hussein. Following his return from Turkey, Keith worked as the Brigade Operations Officer for 4th Brigade, 3rd Infantry Division and as a senior war planner and operations officer during the Balkans conflict for U.S. Army Berlin, Admiral Boorda and Allied Forces South, out of Naples Italy, and for the Commander of the US Army Europe. In 1994 Keith took command of Laguna Army Airfield at Yuma Proving Grounds, flying test missions in support of futuristic next generation weapons and aviation systems which also include testing on an escape pod for the international space station. In addition he served for 9 months as Acting Commander of Yuma Proving Grounds, managing an ongoing test budget of $200 million and more than 2300 civilian base personnel. In 1998 Keith retired after nearly 25 years of military service and went to work as a Regional Employment Manager for the LDS Church, covering a 9 state area with offices in Denver, Colorado Springs and Independence, Missouri. He and his wife Carma have been married 42 years and have 5 daughters, 19 grandchildren and 3 more grandchildren on the way. Keith is a graduate of the United States Army Command and General Staff College, the Combined Armed Services Staff School, the US Army Intelligence Center and School, the US Army Aviation Center and School and the Defense language Institute. In addition He holds two master’s degrees to include Master of Business Administration (MBA).